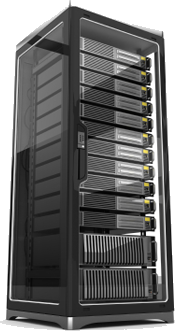 Shared Hosting has many limitations, if your need grows beyond traditional web hosting, Virtual Server is the answer. Why VPS is better than shared hosting? With virtual server you are in control, VPS gives you opportunity to run and manage your own server whatever and however you like! You can select your own operating system and have full root/administrator access to install any software or services as you please just as you would with more expensive dedicated machines but at a fraction of a cost and can scale as your requirement grow with almost no service disruptions. Basically, we have custom built enterprise grade machines, configured them with heaps of memory (think several tens of gigabytes of ECC RAM chips), many disk drives (for great i/o performance ) they don't produce heat, with RAID10 configuration for performance boost compared to conventional mechanical hard drives. added multiple quad core Intel CPUs and partition them by dividing these resources (to be individual independent severs of their own) using popular virtualization technologies mixed together with closely guarded server optimization techniques! Team Speak, Roger Wilco, and other Voice Application Servers! and many more uses, think of one and go for it!